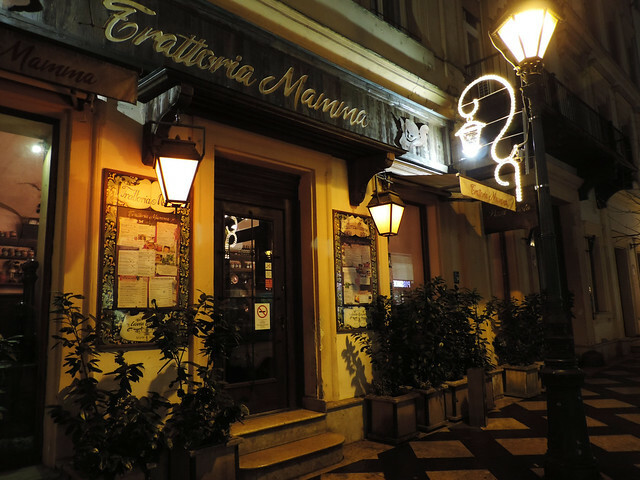 Though we were raving about the Christmas Markets of Budapest in the past years, we realized we’ve never actually put together a proper guide on what and where to explore. Since there’s plenty of time before the upcoming Christmas season, we are maybe not too late with it this year. If you’ve been reading this blog for a while, you know that we’ve grown up in Hungary, and Budapest is our home for more than 3 years now. 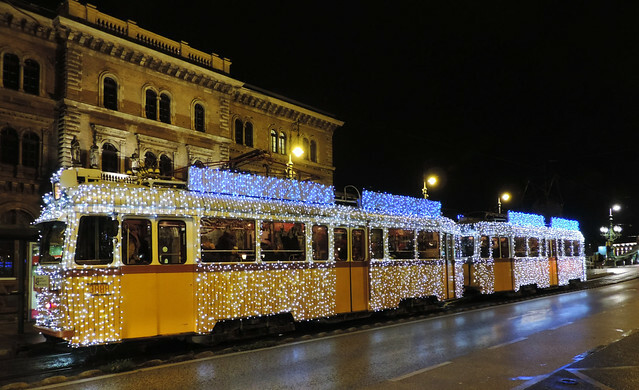 So hopefully we can share some useful tips to help you experience the best of Budapest in the Christmas season. Let’s get started! 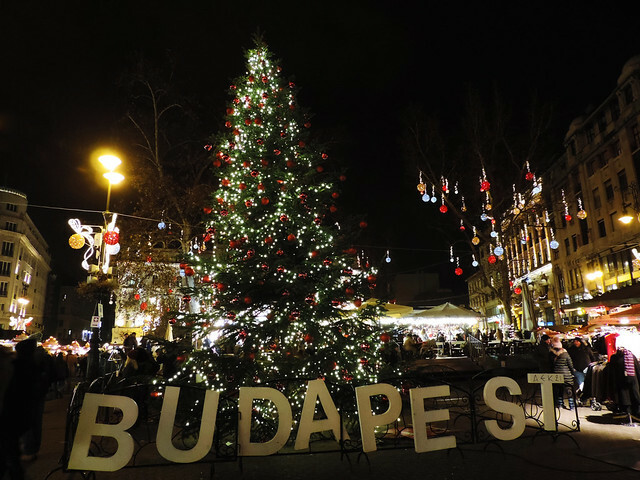 The very heart of Budapest Christmas Markets is St. Stephen’s Square. The majestic St. Stephen’s Basilica towers above the small wooden huts decorated with colorful lights and offering handmade products and traditional food and drinks. 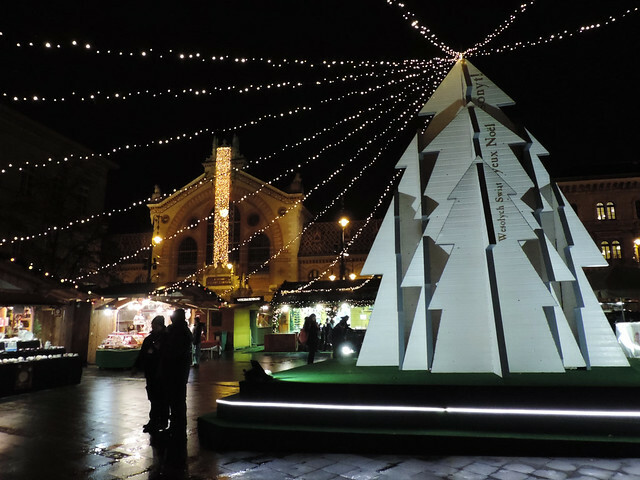 In the middle of the square stands a large Christmas tree surrounded by a small plastic ice rink. But the basilica is not just a beautiful background, it has a significant role. 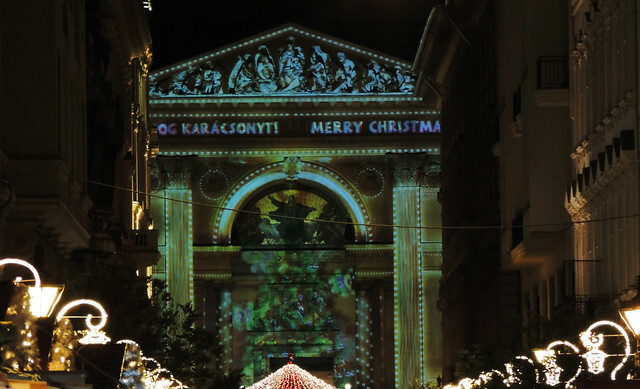 Different light paintings are projected on its facade with music every half an hour after dark. Last year some of these shows were in 3D. 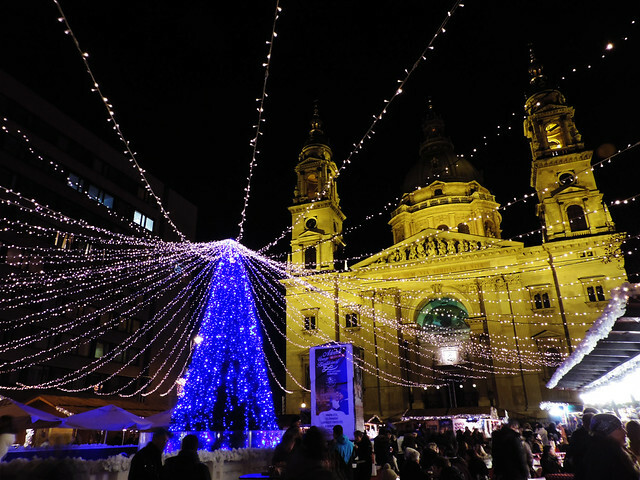 St. Stephen’s Square is definitely our favorite spot in the Budapest Christmas Markets. Every year there are some new ideas in the decorations or in the light shows and we can’t wait what this December brings. The largest craft fair is located on Vörösmarty Square. It’s just 15 minutes walk from St. Stephen’s Basilica, and you can marvel at all the street decorations on the way. Vörösmarty Square has its own large Christmas tree as well as a large Budapest label – a busy spot for taking pictures. 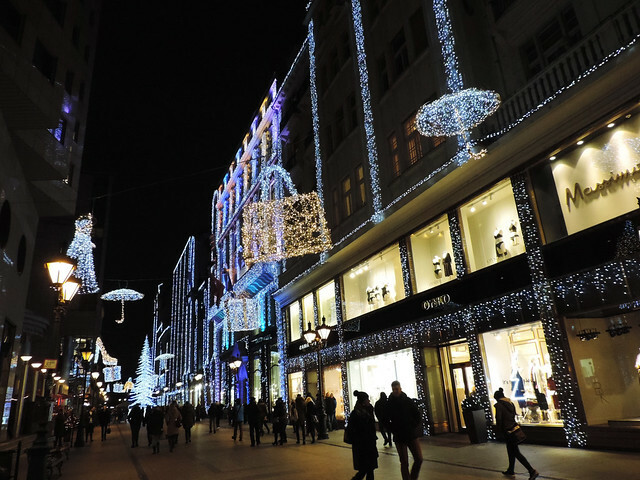 From Vörösmarty Square we recommend to continue your walk along Deák Ferenc Street – the so called “Fashion Street”. It’s full of elegant boutique shops, but something else attracts more attention at Christmas time: street decoration. Probably this street is the most shiny and glamorous in the whole city center. 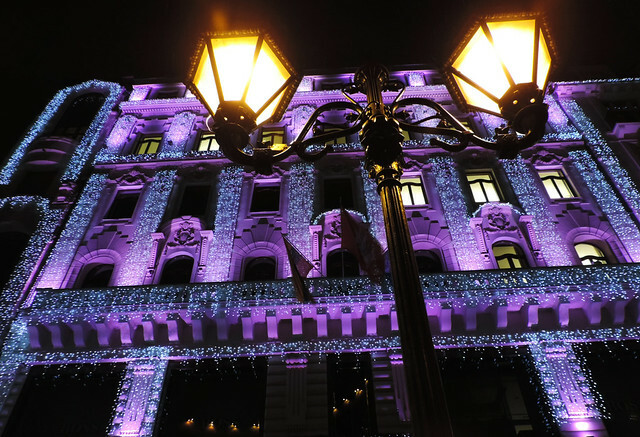 Even the building of the Lithuanian embassy that happens to be on this street is parading in changing light decoration. Deák Ferenc Street also continues the Christmas Fair of Vörösmarty Square. Though officially they are two different fairs, they seamlessly blend into each other. So it gives the impression that the whole city center is one giant Christmas Market. We’ve already mentioned the two largest ones: St. Stephen’s Square and Vörösmarty Square. But the smaller ones are also worth taking a look. Firstly, because they are beautiful, too. On the other hand, they are less crowded. We liked exploring the small markets of Fővám Square, Városháza Park and Jókai Square (right by Oktogon) last year. We’ve already told you about the pretty Christmas lights everywhere in the center. But what does “everywhere” exactly mean? 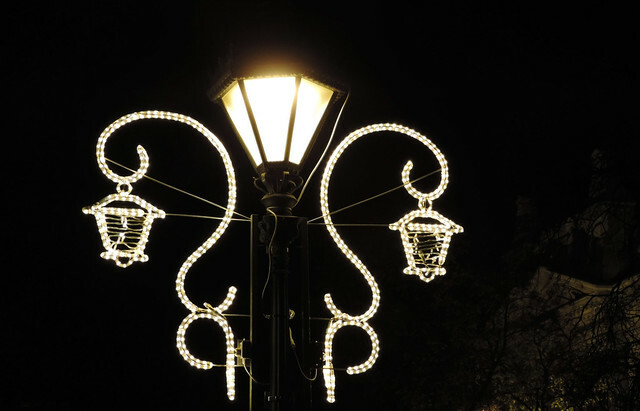 In addition to St. Stephen’s Square, Vörösmarty Square and Deák Ferenc Street, there are all the walking streets between Váci Street and Ráday Street, the Danube promenade, Liberty Square (Szabadság tér in Hungarian), Andrássy Avenue and the Grand Boulevard (Nagykörút). 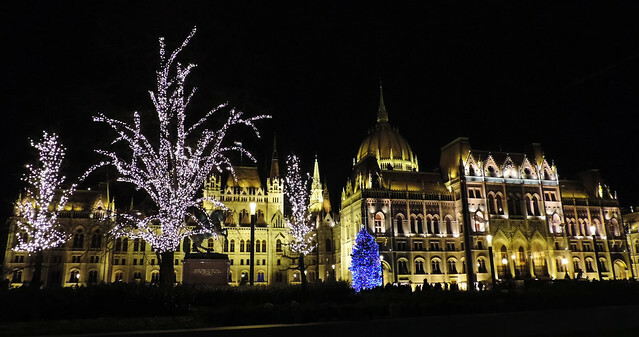 Finally, there’s a spectacular stop that we never miss when we explore the Christmas wonderland of Budapest: the Hungarian Parliament. There’s no Christmas Market in front of our Parliament, but the huge Christmas tree standing proud in front of this stunning building and all the otherwise bald trees decorated with lights make it a lovely place to walk around. We are not the typical foodies but even we can’t resist all the delicious food that Budapest Christmas Markets offer. Especially sweets. Our absolute favorite is chimney cake! It’s a sweet pastry that looks like a tunnel and we couldn’t even imagine Christmas Markets without it. The traditional flavours are cinnamon, cocoa and walnut/hazelnut, but some new versions are gaining popularity quickly – like coconut or almond flavored or the ones with chocolate or ice-cream filling. 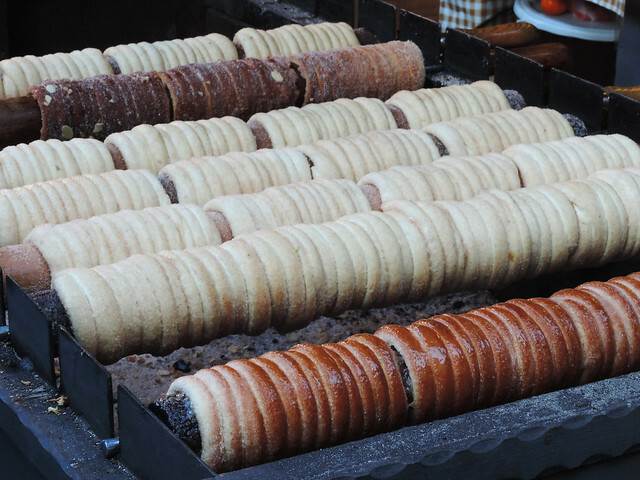 Chimney cake is called kürtőskalács in Hungarian – can you pronounce it? Of course, there are plenty of other traditional sweets to choose from. Beigli is a sweet pastry usually filled with walnut or poppy seeds and it’s served in thin slices. But believe us, only some of those thin slices can make you feel satiated. Strudel is somewhat similar to beigli but in addition to the traditional walnut and poppy seed flavours, special Christmas flavors like apple-cinnamon, sweet cottage cheese and sour cherry are also popular. Flódni is a pastry with apple, walnut, poppy seeds and plum jam. It has a Jewish origin and it’s also a traditional pastry for Hanuka. Zserbó (Gerbeaud) cake is one of the most famous Hungarian desserts and it’s what every grandma bakes at family get togethers. Of course, you can taste it at the Christmas Markets, too. Then you can try to bake it at home if you like it. Here’s a recipe in English. 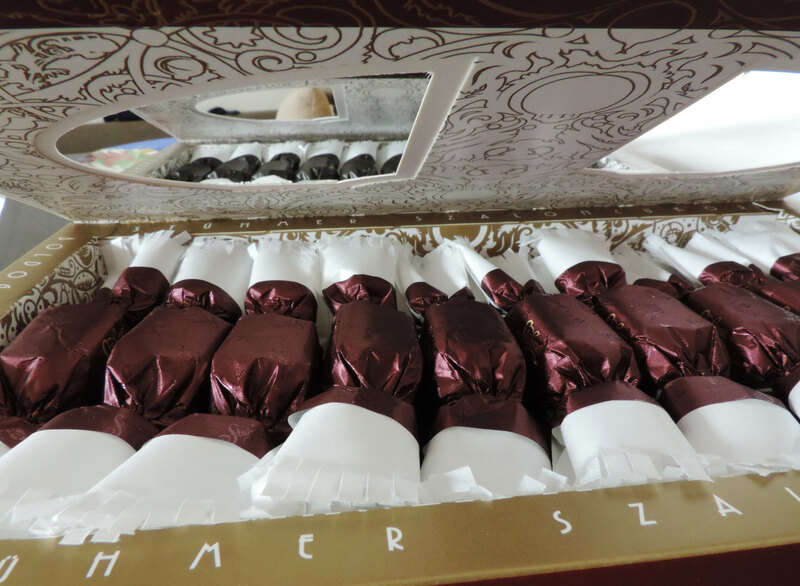 In addition to the traditional pastries, variety of handmade chocolates and marzipans tempt you. 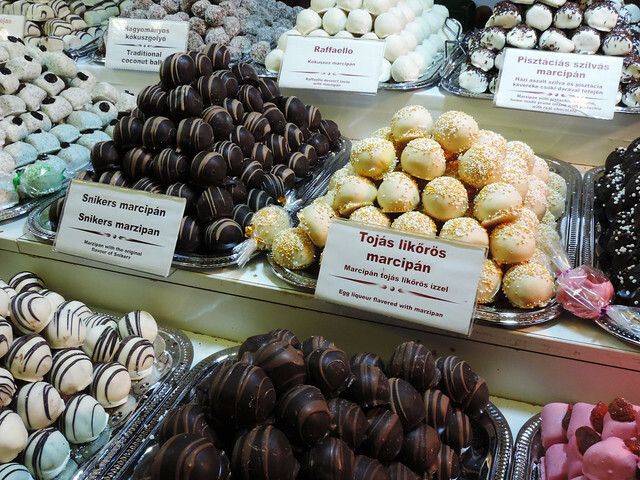 Then there’s parlor candy – szaloncukor in Hungarian. No Christmas tree is complete without it. If you are looking for traditional sweets to buy and give as part of your Christmas present, parlor candy is perfect in our opinion. It can be stored and transported easily, it looks pretty and it is delicious! 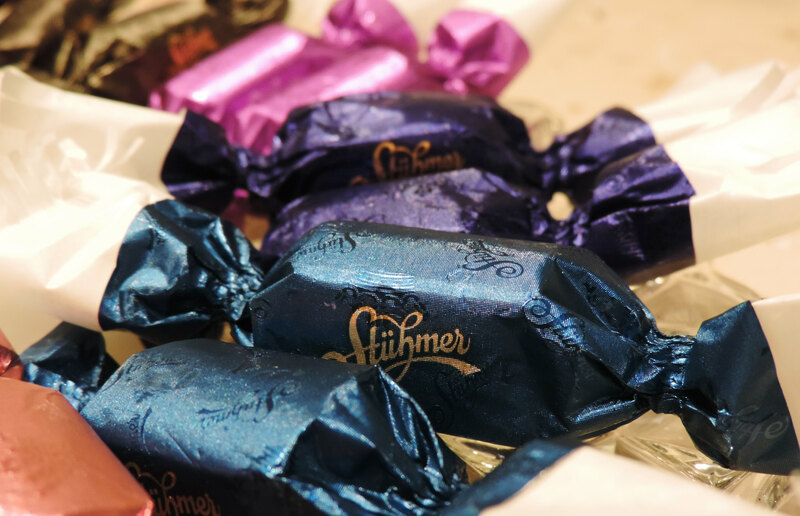 The original flavors are jelly, chocolate, caramel, rum, coconut, walnut and strawberry, but you can find them filled with countless other fillings – like marzipan, cappuccino, hazelnut cream, Irish cream liqueur, eggnog, even palinka. Well, who said it’s only for children? What to eat beyond sweets? But if you prefer being simple, roasted chestnut is a delicious treat to eat while you wander around the markets. Mulled wine. It’s that simple. It’s the traditional drink of most of the European Christmas Markets and Hungary is no exception. At some locations they are served in special mugs that are great souvenirs. Well, now you know where to go and what to eat and drink. And that’s what Christmas Markets are about. You can, of course, buy some presents, too, since there are a lot of nice handmade stuff. 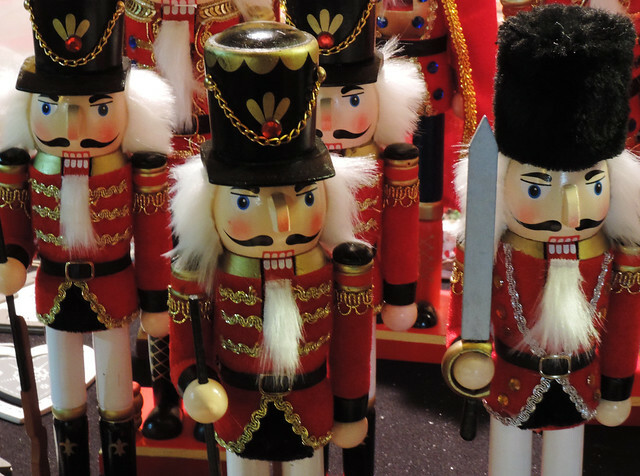 But the point of a Christmas Market is getting together with friends or walking hand-in-hand with your partner, trying delicious meals, drinking hot mulled wine and sharing some good laugh. Are you up to it? Budapest offers a lot to see in any season. If this will be your first time in the city, go ahead and check out our first timers’ guide to get some ideas what to see in Budapest beyond Christmas Markets. 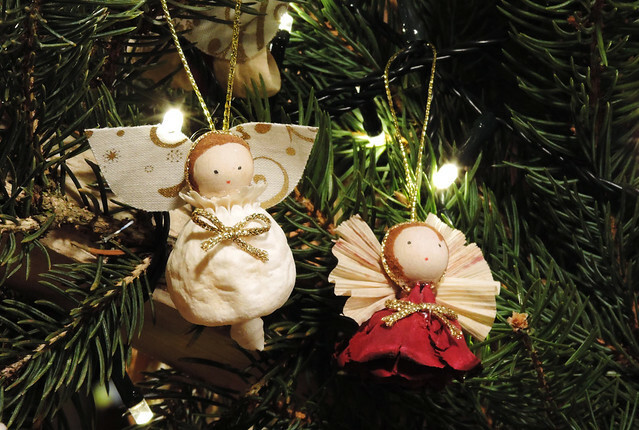 Are you planning any travels around Christmas?